If you need more from your vacation than a beach and a fruity umbrella drink, embark on an unforgettable eco-adventure on one of these three trips. But don’t think the Wild West is the only place for such an experience, journey to Florida for an unexpected green escape. 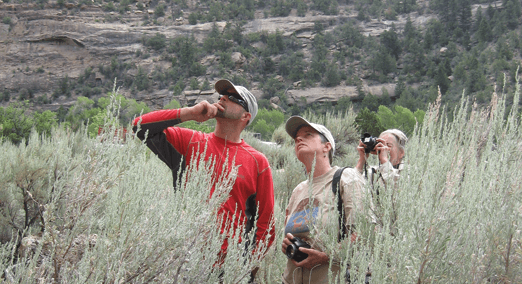 Head south for an educational, fun eco-tour in Moab with Canyonlands Field Institute. CFI is a non-profit focused on education and interpretation about the environment, sciences, culture and history of the area through hands-on activities and learning. They employ expert local guides to teach you about the ecology and geology of Moab while hiking in or near national parks or rafting on local rivers. On these multi-day adventures you’ll learn about the natural forces that shaped Moab’s landscape over time, see historic landmarks and spot wildlife in a small-group setting. 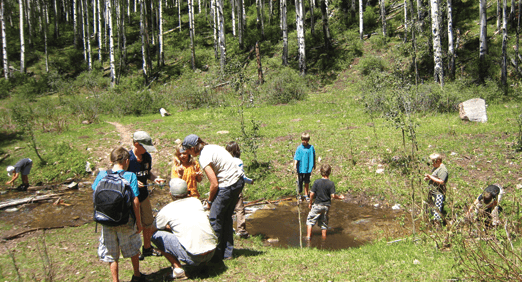 Offered for the first time this year, Family Field Camps are another great way to get your family outdoors. You’ll stay two nights in teepees and spend the days hiking and whitewater rafting while enjoying educational talks and healthy meals. Family Field Camps are planned for this September and October. But if you don’t have time for an overnight tour, half-day trips to see ancient rock art or sunset hikes to Delicate Arch are also offered. For dates and prices, visit Canyonlands Field Institute or call 435-259-7750. Take your getaway to new heights on a thrilling trip to sunny Durango, Colorado. Durango is a mecca for outdoor enthusiasts with endless activities: mountain biking, hiking, river rafting, horseback riding and more. But for the biggest thrills, try Durango’s #1 rated attraction: Soaring® Tree Top Adventures. Soaring is the world’s largest, longest and safest zipline canopy tour and is specifically designed to prevent damage to the trees. Throughout the tour, Eco Rangers discuss the forest’s ecology, history and tree identification methods. 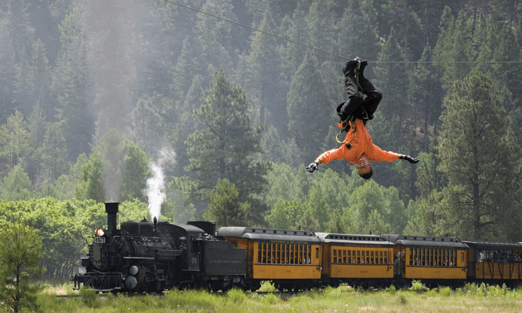 Accessible only by train, Soaring includes a ride to the tour site on the historic Durango & Silverton Narrow Gauge Railroad in a first-class car. The scenic two-hour journey through the San Juan National Forest on this coal-fired, steam-powered locomotive will take your breath away. To fully enjoy the scenery, step out onto the open-air car and feel the wind in your hair. At the beginning of the day, the spans are short and slow to get you used to Soaring, but they quickly get longer and faster. The harnesses are very safe and on many spans you can ride upside down, backwards or spin. Don’t worry about going hungry on this full-day funfest; the crew keeps you fed with homemade caramel cranberry bars and a delectable four-course lunch in the trees. Options for vegetarians and children are available. Conservation efforts, like giving each guest a stainless steel water bottle to refill and serving lunch on real dishes, are great green touches. After lunch, the spans continue getting faster and longer, with many crossing the Animas river. New for 2011, two fast parallel spans have been added so you can race your friends. Tip: Curl up like a cannonball if you want to win! You’ll continue zipping all afternoon, ending on a 1,400 foot span, the day’s longest. You start on a cliff and zoom through the forest and across the river, ending on a platform in the trees. This day of Soaring is an amazing adventure, but what’s truly impressive is the staff. They ensure your safety, get to know you and are great with helping kids and adults get the most enjoyment out of the course. Also, they are First Aid and CPR certified and trained to assist in the event of an emergency. The $439 per person price tag may sound steep, but with everything that’s included, the value far exceeds the cost. The day includes: first-class train ride, equipment, snack, gourmet lunch and a day of zip lining. Soaring Canopy Tours® are open seven days a week from mid-May to October 16, 2011. Advance reservations are required and can be made by calling 970-769-2357. Get more information at soaringcolorado.com. For more distinctly Colorado thrills, whitewater rafting on the Animas River is a must. Mild to Wild Rafting (mild2wildrafting.com) offers half and whole day tours for the whole family or extreme whitewater enthusiasts. Expert guides share information on Durango’s ecology, history and do their best to keep you in the raft in wild waters. No experience is necessary for Lower Animas rafting trips. For high adventure enthusiasts, the Upper Animas is sure to impress. The Upper Animas is one of the toughest commercially run trips in the United States with frequent Class III and intermittent Class IV and V rapids in high water. A safety orientation and instruction is required the night before these trips. To make reservations call 800-567-6745. New this year, take the kids to the Durango Discovery Museum (durangodiscovery.org) for hands-on science projects and activities, like robot building and energy experiments. Located on the banks of the Animas River in a historic AC power plant, this interactive science center is sure to delight kids and adults alike. Open year round, seven days a week. For dinner, enjoy an authentic Irish meal in the heart of Durango at the Irish Embassy Pub (theirishembassypub.com). The food is spectacular (try the fish and chips) and all the furniture and glasses were shipped directly from Ireland. For accommodations in Durango, stay at the beautifully restored, historic Strater Hotel (strater.com). Located just two blocks from the Durango & Silverton Railroad, Strater is the only commercial building in the Four Corner’s region to receive the EPA’s Energy Star rating for energy efficiency in 2010. These updates include: swapping lightbulbs for low wattage fluorescents and using a hot water tank to pre-heat water. 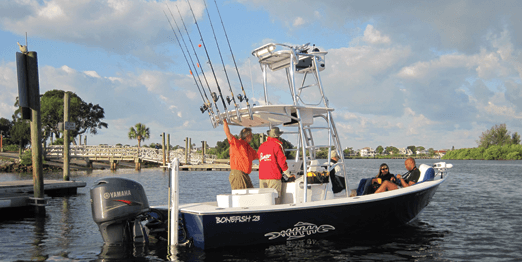 For anglers, or angler-wannabees, take a private boat trip with Florida Backwaters Charter (pasco-gulf-fishing.com). The area near Anclote Key, a river park with a historic lighthouse, bird watching and picnic spots, is a prime fishing spot with gorgeous blue-green water. A fishing first-timer myself, Captain Randy patiently taught me how to cast a line and bait a hook while I took in the Florida sun. His casting and catching abilities continually impressed me and Randy helped me land my first fish, which I struggled to reel in. The 13-inch Spanish mackerel had razor-sharp teeth, which we snapped a photo of before tossing him back to the Gulf to live another day. But fish aren’t the only wildlife you’ll see in the Gulf of Mexico. Expect a grab bag assortment of birds, dolphins and if you’re lucky, a manatee or a loggerhead turtle. To book a chartered tour, contact Randy Schoneman at 727-863-4642 or email barefootbanditcpt@gmail.com. If fishing isn’t your thing, or you just want more water time, rent kayaks and visit the nearby Werner-Boyce Salt Springs State Park (floridastateparks.org/wernerboyce). Fun for all ages, they call this park the “Real Florida” for good reason. The lush trees, narrow waterways and wildlife make for fantastic exploration. Animals like gators, gray foxes, gopher tortoises and West Indian manatees can be seen…if you’re quiet. To see more authentic Florida scenery, visit by the Starkey Wilderness Preserve. J.B. Starkey purchased this land in 1937 for a cattle ranch and has preserved 18,000 acres for the public to enjoy. During your visit, you’ll see long-leaf pines, unique wildlife, lakes and enjoy endless recreation. 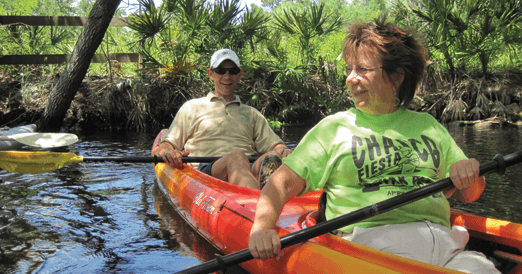 Located in the city of New Port Richey, this park is Pasco’s best destination for camping, hiking, horseback riding, biking and birding. Jay B.’s son, Jay B., gave us a personal tour of the property that, even in an hour-long bus tour, barely scratched the surface of the park’s land. To cover more ground, and see the park’s wildlife, unique vegetation and remote spots, cycling or horseback riding is the best. For road biking, ride on newly paved trails within and directly outside Starkey Park. For a bird’s eye view of Starkey Park and surrounding Pasco County, fly on a Big Red Balloon Hot Air Balloon Tour (bigredballoon.com). Sunrise launches take you high above Pasco County for scenic gulf, park and city views. The hour float wasn’t remotely scary, even for someone as afraid of heights as I am. But balloons are unpredictable; ours wound up a few miles past its expected landing site, deep within the Starkey Wilderness Park. Thankfully, with the help of a GPS, the Starkeys found us in less than an hour. If getting lost in the woods is your type of adventure, stay on-site at the Starkey Park Cabins or tent sites. They come equipped with bunk beds, power and a nearby shower house with heated water. During the night a wealth of wildlife, like deer, frogs and more will make appearances for your viewing pleasure. Visit swfwmd.state.fl.us/recreation/areas/starkey-park.html to book. If you prefer daytime recreation and nighttime comfort, stay in Port Richey’s Homewood Inn and Suites (tampaportrichey.homewoodsuites.com), which include a hot breakfast, dinner four nights a week, a beautiful pool, hot tub and plush rooms. 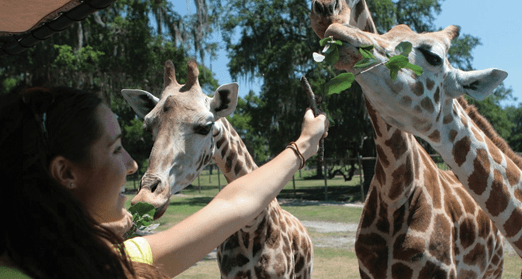 To see exotic wildlife without leaving Florida, visit Dade City’s Giraffe Ranch, a wildlife preserve where you can interact with animals you’d normally see only on safari or behind glass at a zoo. The Ranch isn’t a zoo, but is a family-owned, working game farm that strives to conserve endangered species and preserve them for small public groups to see. To experience the Ranch, you’ll take a 4WD safari tour with stops along the way to see animals. The tour’s highlight is hand feeding giraffes and lemurs, but you’ll also see zebras, ostriches, warthogs and even animals extinct in the wild. The Ranch also strives to conserve Earth’s resources by using solar-powered golf carts and gates. Check camel riding off your bucket list beginning Memorial Day weekend on the new camel caravan tours. Reservations are required and can be made by calling 813-482-3400 or at girafferanch.com. Florida’s climate lends itself to growing fruit, and St. Joseph, a city in Pasco County, is the world’s leading kumquat grower. A kumquat is an orange-like fruit that is eaten peel and all, or used for decorating during the holidays. When in Dade City, take a detour to Kumquat Growers (kumquatgrowers.com) to sample this tiny fruit and the yummy products you can make with it, like kumquat pie or kumquat peach preserves. Open November to April each year. For green eating, visit Dade City’s Kafe Kokopelli (kafekokopelli.com), which uses sustainable practices like using biodegradable to-go containers, cooking with organic ingredients and donating funds to wildlife conservation efforts. After these vacations, you may feel more exhausted than rested, but the memories (and pictures) will be worth it. But if you need to spend a day relaxing by a pool or on a beach after your trip, I’ll understand. And don’t worry, I won’t tell anyone.